The craftsman-style colonial at 383 Old Post Road is in the Beach neighborhood, walking distance to Penfield and Jennings beaches, downtown and the train station. FAIRFIELD — The weather is finally beginning to warm up leading local residents to consider dusting off the flip flops, beach chairs, and umbrellas. Those who live in Fairfield’s Beach neighborhood are especially excited about the prospects of spending more time at the water’s edge. It’s a little too cold yet to get in the water, although that time will come soon enough. 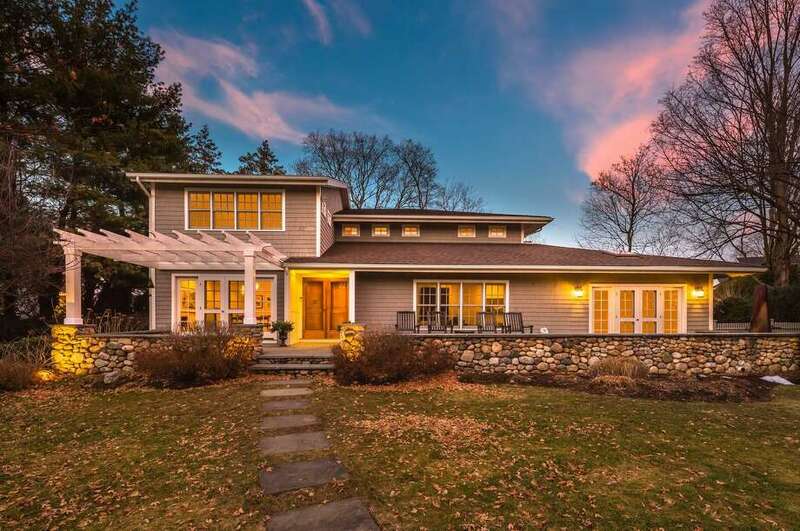 On the nearly three-quarters of an acre property at 383 Old Post Road the next owner can choose between hanging out at Penfield Beach and hanging out in their own backyard when summer finally does arrive, on the calendar and on the temperature gauge. This property has an in-ground swimming pool, an outdoor shower, and a patio. And, while Penfield Beach may be within a comfortable walking distance the listing agent said this house does not require flood insurance, a major plus for an area with this proximity to Long Island Sound. Also within walking distance are downtown shops and restaurants, the train station, the public library, the Fairfield Museum and History Center, and Town Hall. Roger Sherman Elementary School is only three short blocks away. One wouldn’t think so since the address is on Old Post Road, which would make the walk a bit longer, but this gray shingle craftsman-style colonial house cannot be accessed from that particular street. It can only be accessed by traveling down Mariners Way off Judson Road, which is off Beach Road. According to the listing agent the original owner of the house helped to develop Mariners Way, which created for himself and subsequent owners the best of both worlds - an address on a recognizable and well-traveled road but the privacy and solitude of a cul-de-sac only used by its handful of residents. The 3,762-square-foot house sits at the end of that cul-de-sac. It was built in 1985 and has enjoyed modernizing updates. The house sits on a slight knoll set back from the road with slate stepping stones to the front of the house, where there is a long stone sitting wall. This is no ordinary front façade. Where one might expect to find a long front porch this house has instead a long and wide bluestone patio or deck along the front, one side of which is covered by a pergola. French doors open to reveal a completely open floor plan and cherry wood flooring in many rooms. From the foyer the dining room is to the left and the living room is to the right. The dining room has French doors that lead to the portion of the front deck with the pergola. The living room is separated from the billiard room by lower display or bookshelves and two columns. The billiard room features skylights and French doors to the other end of the front deck. Increasing its entertainment value this room also has a wet bar with a wood counter and glass-front cabinetry. In the updated gourmet kitchen there is a large custom-built center island with a wood counter that serves as a breakfast bar for four. The perimeter counters are made of limestone and the cabinetry includes a small built-in wine rack. One of the cabinets has a whimsical metal handle depicting a swimmer; a nod to the pool outside and the beach blocks away. High-end appliances include a Sub-Zero refrigerator and a DCS six-burner range. As with the dining and living rooms, the kitchen is also open to the family room at the back of the house. It has a floor-to-ceiling stone fireplace with built-in bookshelves on either side. A wall on the opposite end of the room also has built-ins. A wall of windows has French doors to the fenced backyard and the pool. This part of the house contains a mudroom with cubbies, the laundry closet, and a half bath with a built-in cushioned seat making it ideal as a cabana area for the pool. This is a pet-friendly house. The mudroom was specially designed to include built-in dog crates. On the second floor there are three bedrooms. The master suite has an office, walk-in closet, and a marble bath. There is a full finished basement in this house, which the listing agent refers to as “a true unicorn.” That’s because the majority of houses in the Beach neighborhood do not have the luxury of basement space. This basement boasts additional play space, a sitting area, full bath, and the potential for a fourth bedroom. Sliding doors lead to stairs to a side yard. For more information or to set up an appointment to see the house, contact Libby McKinney Tritschler of Al Filippone Associates/William Raveis Real Estate at 203-913-9454 or libbyt@afahomes.com.